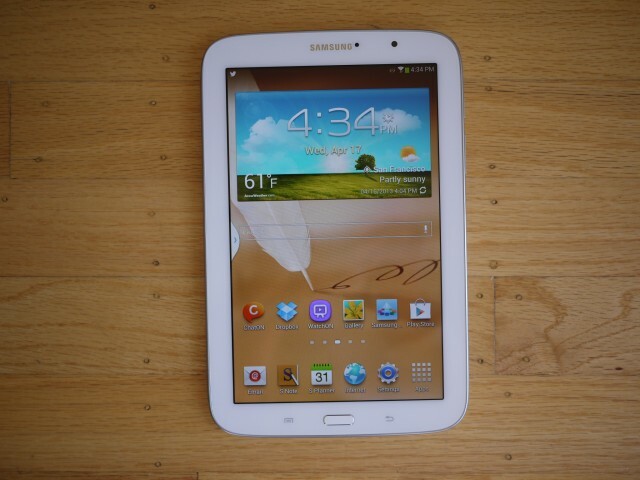 Shopping for a tablet with a stylus may stir up memories of “Goldilocks and the Three Bears.” The Samsung Galaxy Note 10.1 is nice, but too big to hold comfortably in one hand, and the Galaxy Note II is easier to hold, but has a display that’s too small for optimal use with its stylus. 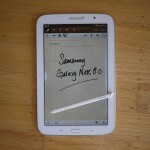 At long last, the Galaxy Note 8.0 is just the right size, except for one feature: Its not-so-fairy-tale-like price tag. Like the rest of the Samsung Galaxy Note series, this Android tablet features a built-in stylus and special apps and features that allow you to jot down handwritten notes and sketches, or use it like a mouse when browsing websites. It’s a handy productivity tool that does plenty of other things. Plus, the eight-inch screen is large enough for using the stylus comfortably, though it’s compact enough to hold in one hand. But, at $400, it’s pricey compared to other tablets in this size range. Apple’s iPad mini, which has a 7.9-inch screen, costs $329, and Google’s Nexus 7, which has a seven-inch screen, is even cheaper at $200 (all prices are for the 16 gigabyte models). 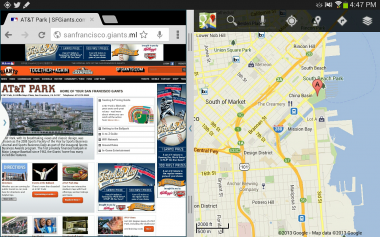 Both are solid tablets, though neither includes a stylus. If the Galaxy Note 8.0 were about $100 less, I’d recommend it without hesitation, but at its current price, only get it if you really want the stylus functionality. 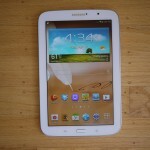 Otherwise, the iPad mini and Nexus 7 are better buys. 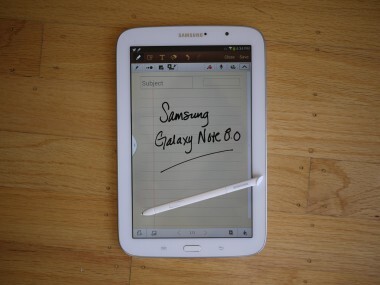 The Galaxy Note 8.0 measures 8.3 inches tall by 5.3 inches wide and 0.3 inch thick in portrait mode. Constructed largely from plastic, it weighs less than a pound, but it doesn’t feel fragile or cheap. 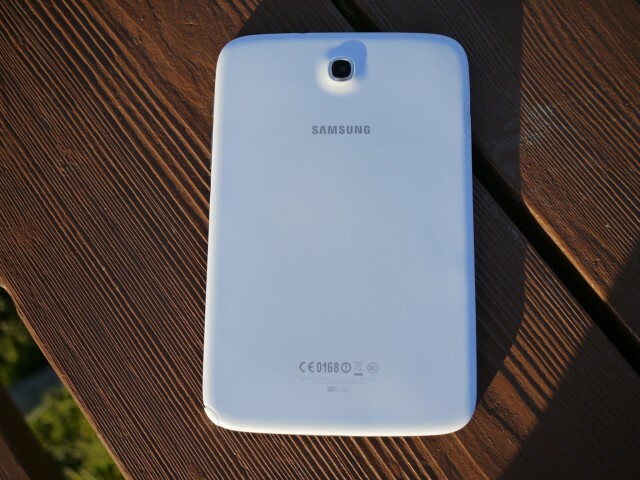 The back is slick, and I wish it had a textured surface like the Nexus 7. The eight-inch touchscreen has a resolution of 1,280 by 800 pixels. By comparison, the Nexus 7 has the same resolution, but the iPad mini’s display has a resolution of 1,024 by 768 pixels. Looking at the same photos in a side-by-side comparison, I found that the Samsung showed the brightest colors, while the Nexus 7 had the sharpest image quality. The latter is due to the fact that the Nexus has a smaller seven-inch screen, so there is less space between its screen’s pixels. Still, viewing videos and reading text on the Galaxy Note 8.0 was an enjoyable experience. 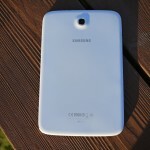 Above the display is a 1.3-megapixel camera, and there is a five-megapixel camera on the back. 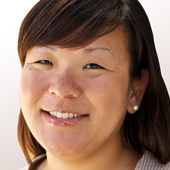 A microSD card slot is located on the left side for expanding memory — something the iPad mini and Nexus 7 do not offer. The stylus — or S Pen, as Samsung calls it — is located in the bottom-right corner of the tablet. Once you remove it from its holder, the tablet automatically launches a window with options for creating various kinds of notes and cards using Samsung’s S Note app, such as meeting notes, diary entries and birthday cards. One of the functions of the S Note app is the ability to convert handwritten notes into text. I was particularly eager to try this out, since I often take written notes during meetings, but have a hard time reading my scribbles later. If I wrote slowly and more precisely, the accuracy improved, but I don’t usually have the luxury of time when taking notes as someone is talking. And even though S Pen allows you to record audio at the same time as you’re writing, I didn’t feel comfortable using the Galaxy Note 8.0 as my main note-taking device. There are aspects of the tablet and stylus that I found very useful. For example, by using the button located near the bottom of the S Pen, you can generate an automatically drawn outline around a photo, map or anything onscreen to clip and save to a note. The preloaded Polaris Office Suite also allows you to annotate Office documents using the stylus, and it was a great way to get some work done on the go. I emailed a copy of this column to myself, and, while waiting for a friend at a cafe, I used the Galaxy Note 8.0 to call out some changes I wanted to make to the story. 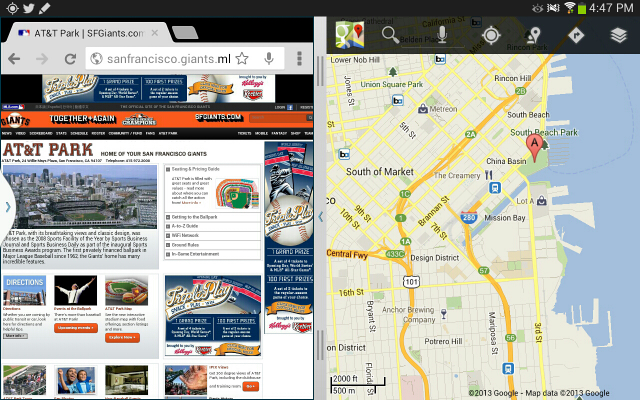 In addition, the Galaxy Note 8.0 offers a multi-window feature where you can have two apps opened at once. 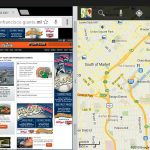 This functionality is limited to about 20 apps, including the Web browser, music player, email, Facebook and YouTube. It was handy to be able to view my email in one window and check my calendar right beside it to see if I was free for an appointment. Samsung ships the tablet with several other apps, including Group Play for sharing photos and documents between devices, the Paper Artist drawing app and Samsung’s new video service WatchOn. I tried them out for curiosity’s sake, but I can’t say I’d use them on a regular basis. 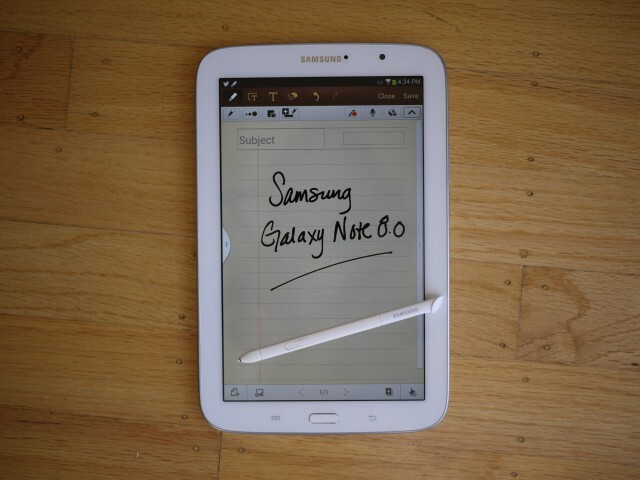 The Galaxy Note 8.0 runs on the Android 4.1 Jelly Bean operating system with Samsung’s customized user interface. Overall, I found performance to be smooth. I experienced little to no delay when launching and switching between apps. Unfortunately, battery life isn’t quite up to snuff with the competition. In my battery tests, where I set the screen’s brightness to 75 percent and played a video in a continuous loop with Wi-Fi and email running in the background, the Galaxy Note 8.0 lasted eight hours before needing a recharge. The iPad mini lasted 10 hours and 27 minutes, while the Nexus 7 offered 10 hours and 44 minutes. With the Galaxy Note 8.0’s built-in stylus and integrated apps, Samsung had a chance to set itself apart from the competition. But an expensive price limits its appeal. Unless you really want the S Pen capability, the Nexus 7 or iPad Mini is the better choice for now.